Our travel blogging research sessions almost always only involves the two of us. 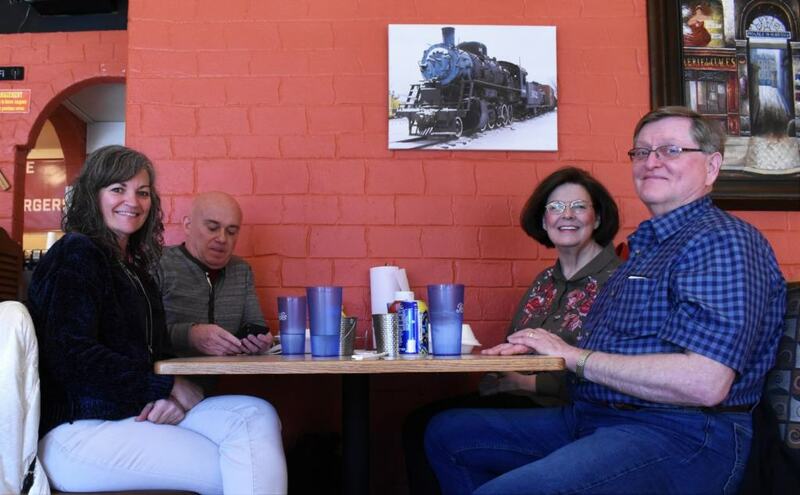 When some new travel friends suggested joining us for a meal, we saw it as an opportunity to include them in one of our visits. It also gave me the idea of sharing with all of you what goes in to a research trip. Since this particular visit only involved one stop, it made a perfect subject for such an article. Since we are sharing a new topic it only made sense for us to visit a new restaurant near us. 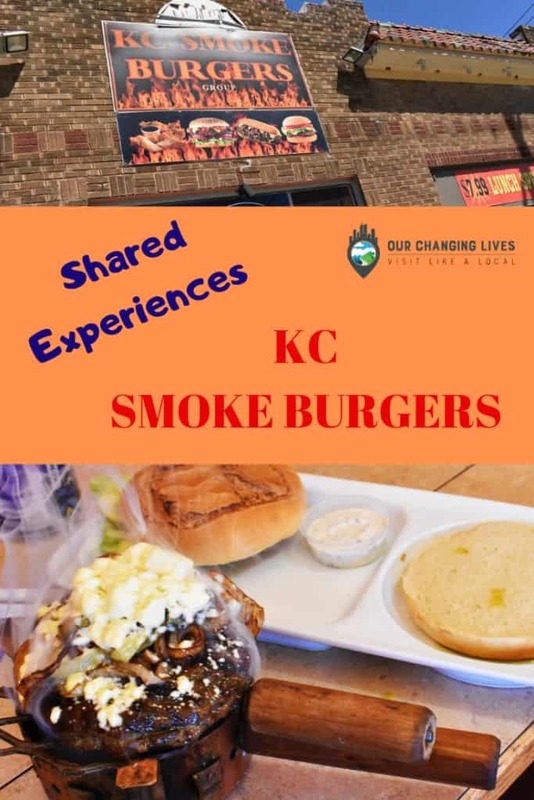 When we spotted KC Smoke Burgers, at 1610 W. 39th Street, it was clear that it is the kind of place we wanted to explore closer. The selection process for this restaurant was pretty straightforward, so the only thing left was to set up the timing. Our friends, like us, preferred to meet on a Sunday. KC Smoke Burgers opens at 11:00, so we decided to meet at Noon. I sent the restaurant a message through their Facebook, but it was merely meant to let them know we would be visiting. I mostly do this as a heads up, that there will be someone walking around taking photos. We were hoping that the timing of our visit would mean a smaller crowd. Arriving promptly at 12:00, we found a parking spot right out front. The signage on the building makes spotting the restaurant easy. Once inside, we saw that the place was decorated with a southwest theme, and they even give a nod to John Wayne. Our friends had arrived a few minutes before us, and had selected a table large enough for the four of us. KC Smoke Burgers is a table service style restaurant, so after we arrived our server came by to discuss the menu. We had been under the misconception that the restaurant was just a burger joint. In reality, they have a pretty broad assortment of dishes. Diners can choose Shawarma, Gyros, or Philly Cheese-steaks. An assortment of appetizers looked tempting, but something we noticed prevented us from ordering one. The burgers at KC Smoke Burgers are 1/2 pounders, so we knew that we would definitely get a filling meal. 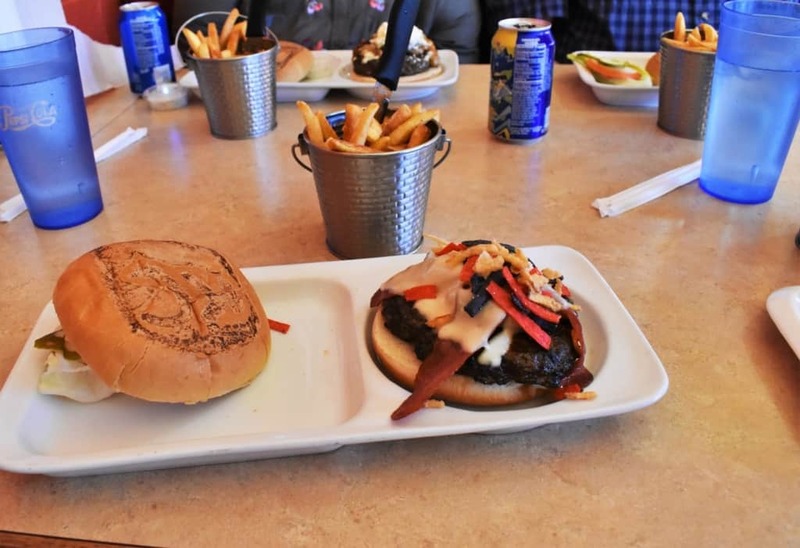 They have a grouping of smoke burgers, as well as an assortment of specialty burgers. Two of us decided on specialty burgers, one person selected a grilled chicken sandwich, and the final choice was a Philly Cheese-steak. We felt that we had covered the menu fairly well. I got busy taking photos, while our meals were being prepared. Soon, our server appeared with smoking trays. 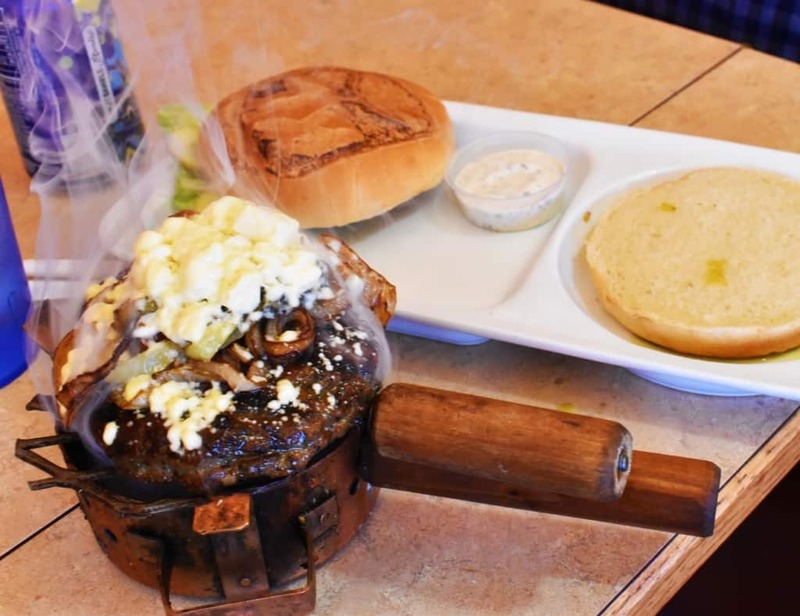 The burgers are delivered on a miniature charcoal grill, which adds a fun element to the meal. Once all of our dishes had been delivered, it was time for more photos. Our friends had been warned that I feel the need to record multiple images of our experiences, since you never know which will best fit the article. With our meals laid out before us, it was finally time to dig in. Since we had all ordered different plates, we all had unique taste experiences. As we dined, we discussed the highlights of each sandwich. The burgers had a delicious smoke flavor, which accented the various toppings on each version. 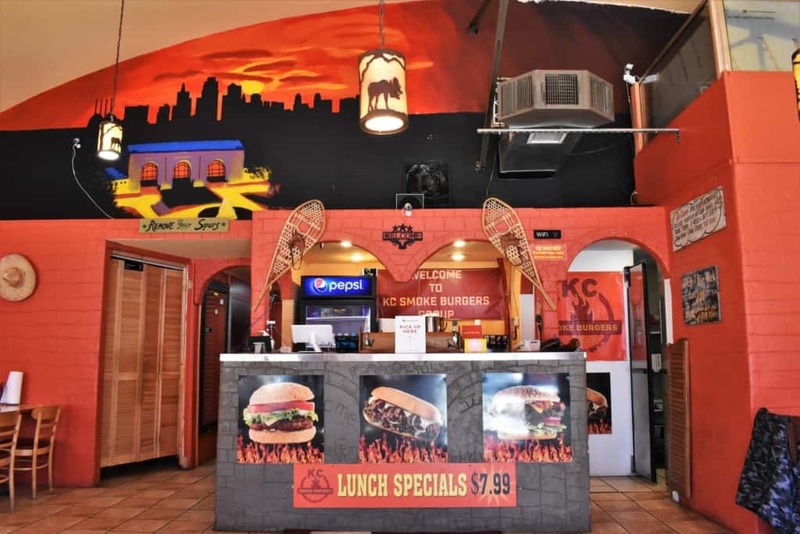 It was agreed that KC Smoke Burgers has a good niche in a city filled with tempting restaurants. Soon our conversation turned to travel, since both couples had been bitten by the travel bug. In most of our articles we try to add at least one selfie. Over the past year I have been upgrading most of our electronics, but with new technology comes new potential issues. Our new camera has the feature of remote photography, but requires a good WiFi signal to work correctly. I was struggling to get a consistent signal, so that I could snap a group photo, and only got it to work temporarily. It actually captured this one shot, which I was unaware of until I downloaded to our computer. To cover our bases, we took a few snaps with my cellphone, but once I saw this shot I knew it was perfect. It certainly shows the challenges that we face trying to get that “picture perfect” shot. In the end, we had a good visit, some delicious eats, and gained some insight on potential destinations. We would call that a pretty successful research outing. Thanks to Carol and Joe for joining us on this little road trip. 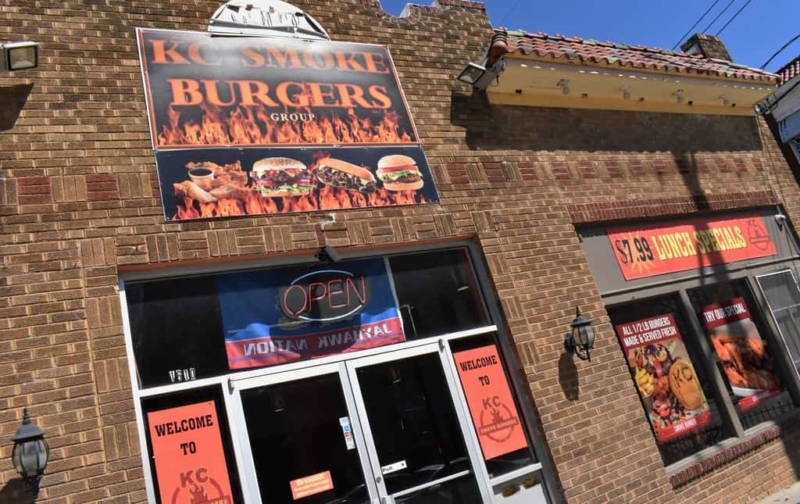 How many of you are going to sample KC Smoke Burgers now that you read about it?